Recently saw a video about the newest robotics capabilities and it gave me an eerie feeling. It showed robots from Boston Dynamics trudging through the snow and lifting and carrying, all on two legs. I cannot stop imagining a world where these robots acquired super intelligence and are fighting a war against the humans to take over the world like they did in the movie Terminator 4 Salvation. Now, Google-parent Alphabet has listed the company for sale, and I cannot help speculating that I was not alone in this eerie feeling. I think these robots are cool. There’s a caveat: they need to be under complete control with an easy way to disable them as they put to use to help humans in whatever mundane tasks desired. I think of automation, to a certain extent, as I would a knife. It can be used to harm people or as a productive tool to cut a loaf of bread. It all depends on the user. You can’t blame the knife. We certainly wouldn’t want to do without this important tool. Of course, many more tools like the knives have taken a prominent place in our lives and as humans we have figured out ways to not just survive but thrive with these technologies by leveraging them to our benefit. (You can consider nuclear power as another example.) As human beings, we have a decent track record at succeeding in these efforts. On the other hand, there have been exceptions. I’m thinking of long-ranging nuclear events such as disaster at the Chernobyl nuclear power plant and the bombings of Hiroshima and Nagasaki as examples. However, another important question remains over and above these concerns: How will automation impact our lives economically? As we rush to innovation in an effort to make things hyper efficient and hyper productive, we need to consider the impact on people. We need to look at ways to employ the people who have been eliminated from the workforce by automation. The invention of the PC, along with word processing, email, and spreadsheet applications, added plenty of efficiency to offices. It also meant that most people didn’t need a personal secretary any more. Instead, everyone did his or her own correspondence and such. What happened to all the secretaries and mail carriers that were eliminated from the work force? If the benefits of these innovations had been spread across the organization, perhaps we could have found a way for everyone to work less rather than fewer people to work more. Instead, we are all connected via smart phones and we are working harder and longer than ever before. We even answer voicemails and emails on vacation. This question is even more important because the pace of innovation and the race to super efficient hyper productive systems and tools is only accelerating. That translates to potentially accelerating humans out of a broad array of jobs. I cannot help comparing this with the evolution of cars. 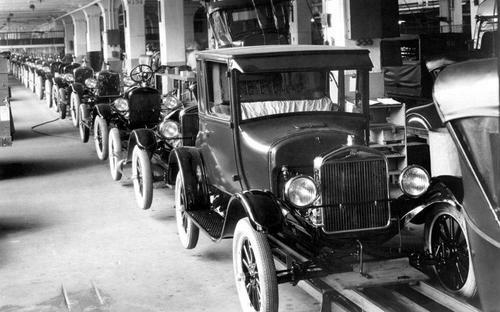 When Henry Ford made cars in Detroit, he not only priced the cars appropriately, but also increased pay for his factory workers and reduced working hours. Eventually, all the companies in the Detroit area followed the $5 per day and let their employees work for 8 hours. After the infiltration of automobiles, workers could afford a car and had free time and weekends. That enhanced the market and the economy. These customers became the best example to encourage the rest of the public to jump into this new thing called cars. The car phenomenon gained traction much faster. Consider how the scenario would have changed if Henry Ford had made these cars and kept the price so high that none of his factory workers were able to afford one. It’s an economic pattern that has emerged in the modern world. It’s a reality in newly minted automation solutions. I suspect that the initial benefit of automation technology may wane. If automation puts people out of a job, that translates to fewer potential customers. In short, the automation phenomenon is reducing the size of its own potential market. As we automate, we need to consider ways to ensure that the technology enhances our economy rather than detracts from it. I would hope that the economic pie would double or even triple the amount growth enjoyed by the technology itself. It should, even in enhancing efficiencies, offer ways to create new jobs for those that are being phased out. If the workforce is maintained, the potential market is enhanced. Ideally, big technology shifts should allow us to pursue bigger goals. Maybe we find a way to build a human world on Mars, for example, and create the next frontier for exploration. Inventors who benefit economically from new technologies have a moral responsibility to consider how to create a path forward that enhances our world economically. Instead, we see a trend of the accumulation of wealth by a few people—and those people control the resources. I don’t want a world where a few people manage huge armies of robots—and the vast majority don’t have a chance to succeed. How do you think we can balance between technology innovation and economic growth? Does the impact of automation on the workforce worry you? Let us know in the comments section below.